Wisdom of Life. : Accidents can happen at home. The safest place could be the most dangerous place. I got a shock when i received news of one of my client who was admitted critically from a fall. It was quite late in the evening when Mike was taking a puff for a short break at the balcony outside his own office. Perhaps he was tired after a long working session, without control he went into a spell and accidentally fell over the balcony dropping all the way from the fourth floor. He survived with two bad broken legs and needed two major operations. Can't believe right!!! Less than a year ago, one of his engineer who was still single slipped while inside his own bathroom which was wet at that time. He fell backward with severe head injury. Went into coma with two neurosurgeries done within a two weeks period. So sad! He did not survive. A middle aged lady client slipped from her home staircase which was polished to tip top shinning. From the second floor, she slipped all the way down to the ground floor. She broke her right pelvis bone and several operations were done within a two years period. Her husband was deprived of making love with her. Another sad story. Another young housewife broke her left leg while trying to chase away her cat which was eating their kitchen food. She accidentally stepped on her own sarong, without balance she fell heavily on the floor. She could not walk for almost half a year and the husband had to turn maid for the home. 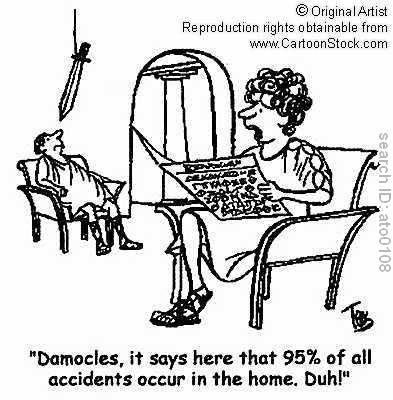 I can continue with more domestic accidents i had seen so far in my career as a life insurance agent. But thanks God! All these accidents were adequately covered with proper medical insurance. Otherwise it would cause my friends a bomb to pay for the hospital charges. Please be careful, even when you are in the office or at home. Accidents can happen!!! Food for thought - "You don't need to pray to God any more when there are storms in the sky, but you do have to be insured" - Bertolt Brecht (1898-1956) German writer. Hello everyone, I just registered on this awesome community forum and desired to say gday! Have a impressive day! Thank you for coming by to read this title. See u again. Thank you for reading my blog. I'm on facebook under Robert Foo. Two wrongs don’t make a right, but two Wrights made an airplane. Thank you for coming all the way from Japan. The funny of life is, as you grow you tend to be wittier. Your wright and mine could lift both of us to a higher level of thought. Thank you for having some fun here. I have twitter and facebook but not active. You have to visit my blog here. Thank you for coming by.